Grate the tomatoes on the large holes of a box grater. As you grate, the flesh of the tomato will separate from the skin, and you will be left holding the skin. Discard the skin. Place the tomato pulp in a blender with the tomato juice, bread, paprika, garlic, vinegar, olive oil, and salt. Allow the mixture to sit for 10 minutes or so to allow the bread to soften. Purée the mixture until smooth; taste, and season to taste. Chill the soup. 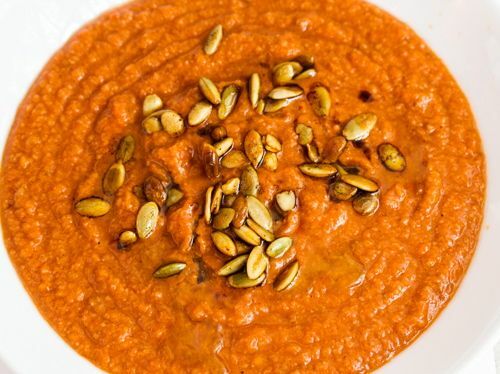 When ready to serve, whisk the soup to reincorporate any liquid that has separated, and serve in chilled bowls with toasted pumpkin seeds and good olive oil.